For all the furore that’s erupted over the illegal practices of Rupert Murdoch’s journalists in Britain, there’s been precious little debate about how those practices have become almost routine in the news gathering efforts of many of his competitors. How much easier it is to demonise the infamous “Dirty Digger” than to have a rational discussion about how the practice of journalism has been steadily debased across the board because of cut-throat competition and the imperative to turn a buck. Or a pound, in the British context. This is not to excuse what has happened at the now defunct News of The World and the behaviour of its reporters, editors and executives . 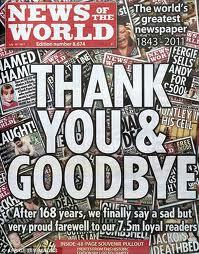 They’re being rightly vilified for their practice of what’s referred to as “the black arts” of journalism. But scratch the surface and it’s clear that many of those now pointing the finger of blame at Murdoch have skeletons in their own closets. We’re providing a link here to an illuminating article by Stephen Brook – a former journalist on The Guardian – that details just how many of Britain’s media outlets have hired private detectives to hack into the mobile phones of people in the news or steal their private information. Rupert Murdoch, of course, is an easy target – the Lord Voldemort of the media who’s built the biggest empire the world has ever seen. But as he’s pilloried, loses all chance of making the biggest takeover of his career in BSkyB and is perhaps forced out of Britain altogether, it’s worth remembering his good points. He’s one of the biggest employers of journalists in the world. And while many of his media outlets are of the trashy tabloid variety, the revenue they raise helps sustain some of the world’s greatest newspapers. In Australia, for example, he founded the sole quality national newspaper, The Australian, in 1964 and has kept it going despite the fact that it’s evidently never made a profit. Whether you’re in Thargomindah or Oodnadatta, you can walk into a shop or newsagent and The Australian will often be the only newspaper there. It reaches parts of the country the other papers never reach, providing the entire nation with quality food for thought. No mean feat given the diet of mindless pap force fed us by the rest of the media. 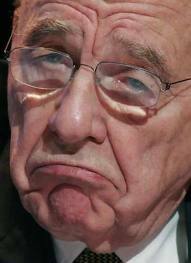 Has Murdoch lost his touch? There’s plenty of evidence to suggest that he has, not least his ridiculous and very public defence of the indefensible in the form of his British chief executive, Rebekah Brooks. As Rebekah Wade, she presided over some of the worst excesses that have been exposed. Brooks claims that as editor of the News Of the World, she had no idea of the illegal activity taking place there. But it’s been clear from the start that her position is untenable and why Murdoch is sticking by her God only knows. It’s said that he regards her as family, a surrogate daughter. But to tell the waiting media that he’d flown into Britain primarily to support Brooks when hundreds of blameless journalists were suddenly on the street displayed an appalling lack of sensitivity and judgment. At 80, Murdoch’s age is also showing for the first time. Mouth open, sound asleep in the front seat of a Range Rover with the News of the World splayed across his chest. It wasn’t a good look. Is his succession plan unraveling, the notion that son James will eventually takes the reins at News? It certainly seems that way, with James Murdoch facing the possibility of criminal charges in America for making payments to foreign officials that contravened US law. If those stick, James will never be allowed to run a media business in America. And all this when Murdoch faces a group law suit in the US that alleges that he and his family have run News Corporation – a public company – as a private piggy bank. 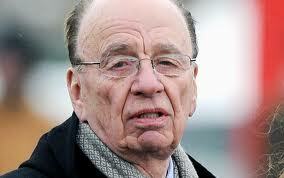 The entire British political and media establishment now has Murdoch’s blood in its nostrils. It’s certainly payback time for all those politicians who once either feared Murdoch or did everything short of kissing his nethers to curry favour with the “Sun King”. Now that the man who brings us the news is the news himself, you can be sure this story has a long way to run. But Grubsheet couldn’t suppress a chuckle when we saw the death of the News Of The World as front page news in Britain’s Daily Mail. “The End of The World”, the headline screamed. Every sub-editor’s dream. 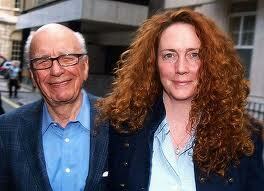 Postscript: Rebekah Brooks bowed to the inevitable and resigned on Friday. On Sunday, she was arrested in connection with the phone hacking scandal. The world awaits her appearance and that of Rupert and James Murdoch before a House of Commons select committee on Tuesday. These are the questions that the trio needs to answer, according to The Guardian newspaper.